I came to US at the tender age of 18 like many other Iranians to study at university and go back home. As a young person it was very fascinating for me to meet other young people like myself from all over the world and see how much we were alike despite our differences. I felt I can be true to myself and appreciate the diversity around me. It was the celebration of our differences, which was an awakening experience for me and nurtured my interest in cultural studies. 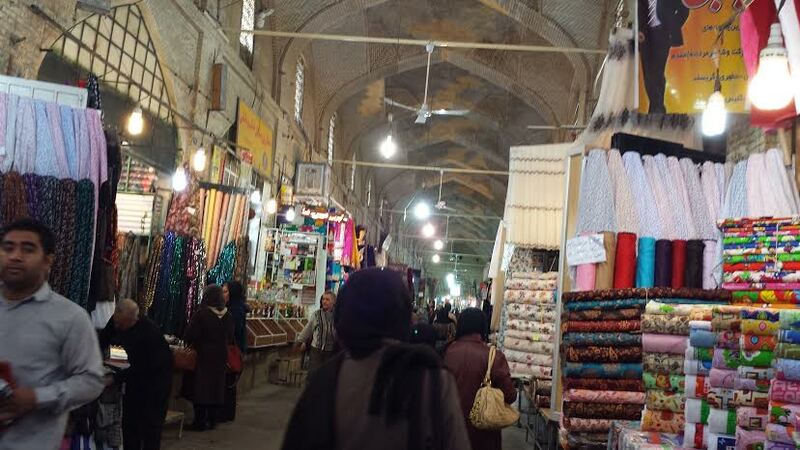 I became very interested in learning more about Iranian culture after I got married and had my two boys. This new-found interest turned into a real passion which has kept growing into my academic interest. And now my journeys to Iran have made me feel more at home. I arrived at Imam Khomeini International airport around 2:00 AM a few days before Chaharshanbehsouri. 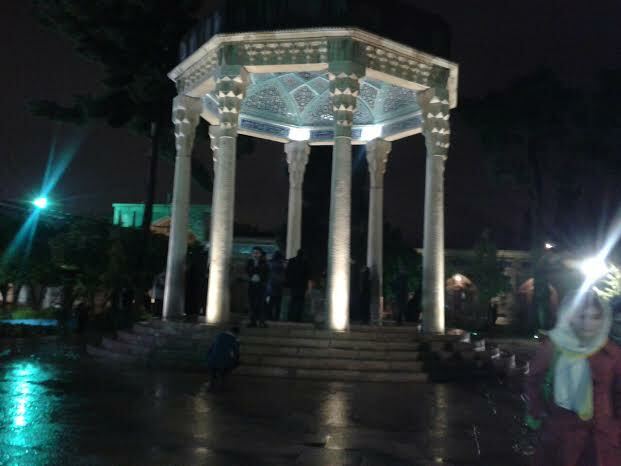 My sightseeing itinerary included: Tehran, Isfahan, and Shiraz. 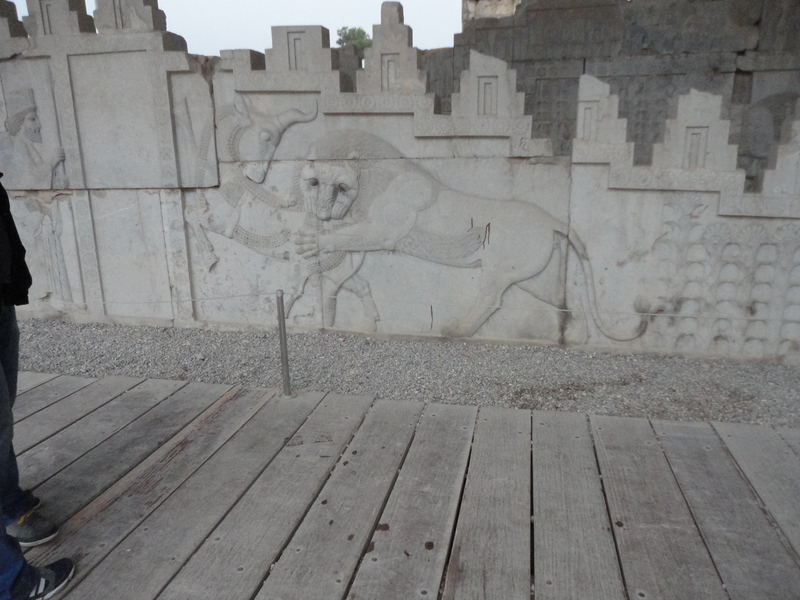 I was ecstatic to go to Shiraz and visit the ruined palaces of the Achaemenid Empire. We took an early morning flight from Tehran to Shiraz. I was accompanied by my sister and my niece. As soon as we were on-board, the flight attendant announced the name of the captain: Mrs. Shams. A female captain (Khanoom Khalaban)? We were all very pleasantly surprised! My niece suggested that I take a picture with her at the end of our flight. Good idea, I thought. The prospect of showing the picture to my students was a cultural education in of itself. 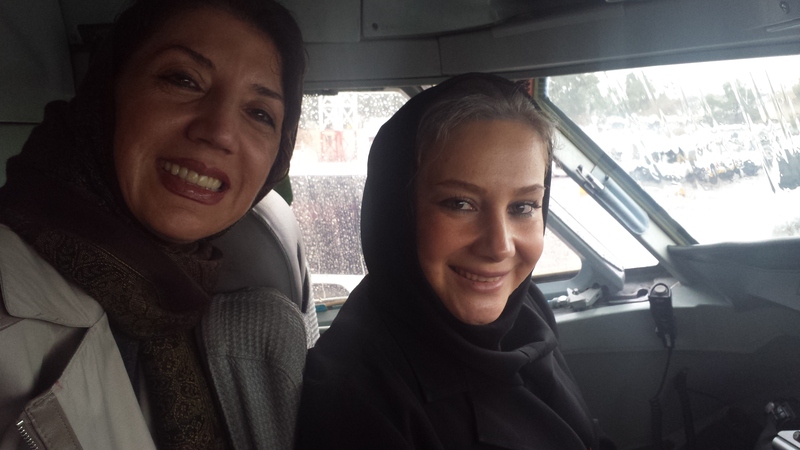 I recalled my students’ perplexed reactions when they saw women driving in Iranian films. “Do women drive in Iran?” They asked. 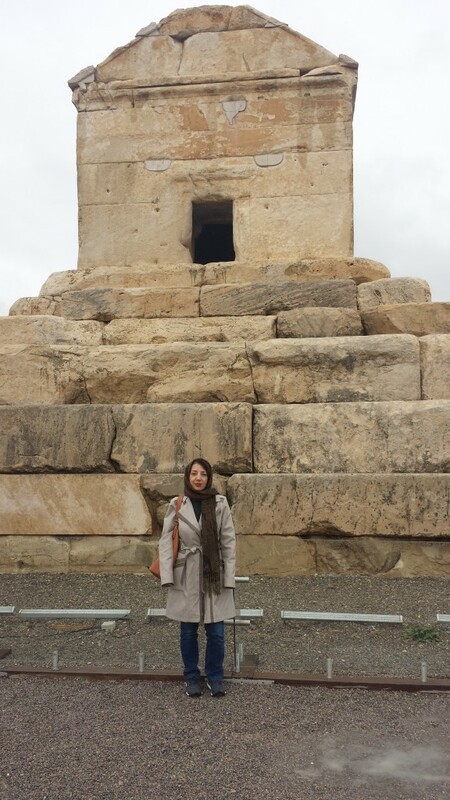 The tomb of Cyrus the Great, resting on high platform is the main point of attraction in Pasargadae. Although the palace is in ruins, we can envision its past glory. An amazing feeling of being connected to the past! Finally my dream of taking a picture in front of Cyrus’s tomb is coming true! Persepolis (Takt-e Jamshid, the mythological king in Shahnameh, the Iranian epic) The entrance into Persepolis reminded me of Disneyland. It is surrounded by tall trees with beautiful landscaping, gift shops, and restaurants. But as you set foot in the monuments, you’re reminded by signs and guards on duty not to touch the tiniest gravels. You realize you’re standing inside a very sacred place. At this moment so many storybooks pop up in the head as one starts ascending into the main platform through the double stairways to Apadana, the main audience hall. Lion devouring the bull symbolizing the arrival of spring, the Persian New Year. 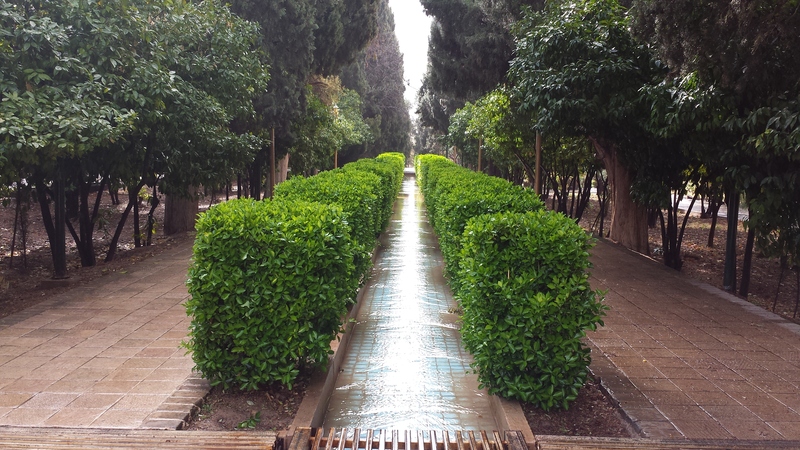 Eram garden- In Shiraz built during the Ilkhanid dynasty in the 13th century. 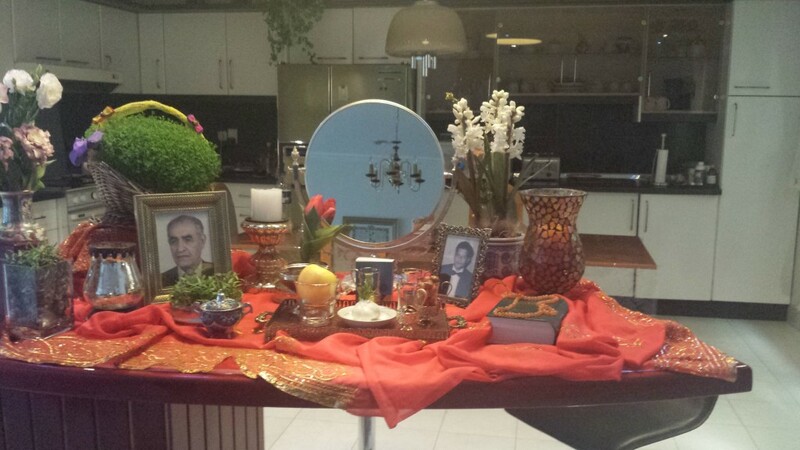 My sister’s Haftseen – The arrival of spring, Nowruz, new day. 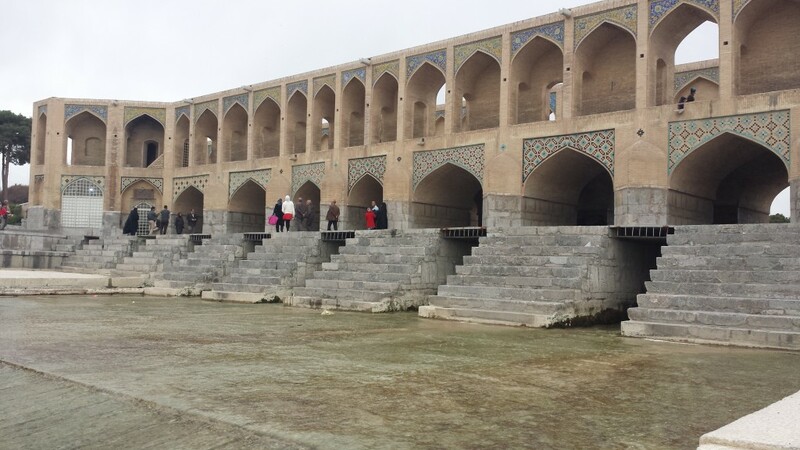 Khajoo Bridge, Isfahan, a marvel in bridge engineering built by Shah Abbas the Great, Safavid in 17th century. I returned to Tehran one day before my departure. 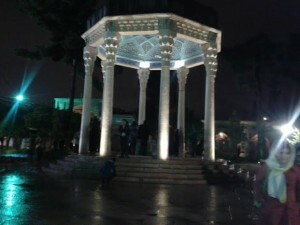 My brother scheduled the itinerary for the day: Milad Tower in the morning, lunch, Ab & Atash (Water & Fire Park), Tabiat, pedestrian bridge, and Taleghani Park in the afternoon. I left Iran the next day. 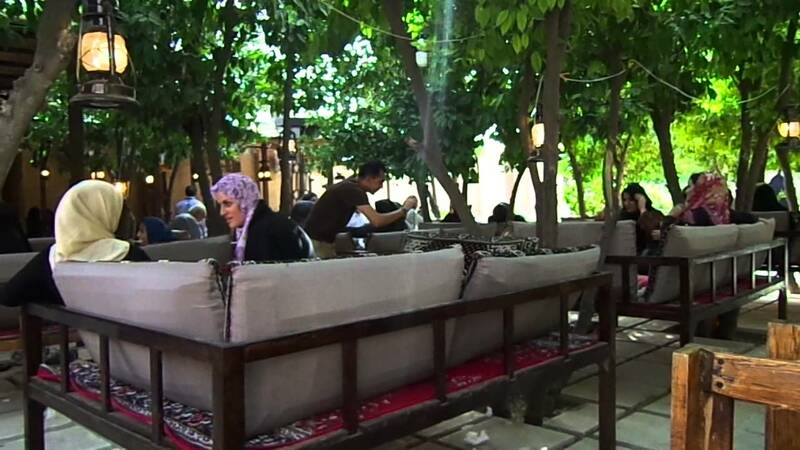 The trip feels like a dream in some ways while the reality of my family’s love, the people’s hospitality, even the merchants’ ta’arof, ghabeli nadareh ( it’s not worthy ) made me feel at home.